Second place went to a much more attractive piece of heritage: two marvellous Soho ghost signs. The Olympics had to sneak in somewhere, and did so via my selection of national Olympic Houses - from the Danes' LEGO stadium model to the craftspeople of the African village. A piece of pure silliness takes fifth place: Aldgate's underground toilets still display advanced warning of changes made fifteen years ago! In top place are the morbidly fascinating catacombs of Paris, created from its underground quarries and filled with the bones of its dead. It's perhaps testimony to the power of the image search that a less skull-filled companion piece has never received as much attention. Back in London, but originally from much further afield, the British Museum's wonderful Assyrian animal carvings are another long-term favourite. Heavy rains have seen the Thames Barrier close several times in recent days. Thankfully, it's kept well-maintained, with an annual closure for inspections and checks. I took a look in 2008. An Open House visit to a local property, Stone House, allowed me to share one of Lewisham's hidden gems. The servants' bells at Tyntesfield are a reminder of the realities of stately home life. It seems that the New York Times was unimpressed by such British technology, however. I'll give special mentions to the ghost signs and Postman's Park pages which have also proved popular throughout the year. Finally, and most importantly, huge thanks to everyone who has read and commented throughout 2012. My very best wishes for 2013! As the bank holidays finish and many of us head back to work, we should spare a thought for the man who gave many of us yesterday off. Yesterday's bank holiday may have offered indifferent weather, but it's still cause to be grateful to Sir John Lubbock, instigator of such days. He was a true Victorian polymath: a banker, MP, archaeologist and scientist (where his work extended across entomology, anthropology and statistics). Among Sir John's diverse parliamentary interests was the increasing of workers' free time. In pursuance of this, he was responsible for the Bank Holidays Act 1871. It created four new bank holidays in addition to the commonly-recognised Christmas and Good Friday. Easter Monday, the first Monday in August, Boxing Day and Whit Monday became recognised days of rest in England and Wales (the last of these has since had its date fixed as the final Monday in May and several more have been added). This innovation was, unsurprisingly, very popular and the days were nicknamed St Lubbock's Days (a piece of slang which seems to have persisted until the First World War). It's impressive to think that the man who changed our working lives so significantly was also the inventor of the terms palaeolithic and neolithic, a prolific author on natural history, and a leading light in many learned societies and professional organisations. If such a busy man could say "rest is not idleness", we can all feel justified in enjoying our days off! Image: John Lubbock, First Baron Avebury, from Wikipedia. The Boxing Day tube strike is becoming a tradition, but there are plenty of others which are more enjoyable. Here's a quick round-up of some London-y festive favourites. The Christmas lights on Oxford Street may be a Marmite advert this year, but there are plenty of more seasonal illuminations to be found. Discover them with Westminster Walking - and as a bonus, the walk starts and ends in pubs! It runs on Sunday and on Thursday 27 December. Christmas crackers are a London invention (in France, they make do with sweets). Confectioner Tom Smith adapted the French bon bon wrapped in paper by adding a motto, then the all-important snap; finally, he replaced the original sweet with a gift. Smith is remembered by a fountain in Finsbury Square. There's film of Edwardian cracker-making here. Perhaps the most challenging London Christmas quiz is the fiendish effort from London Reconnections. There are prizes, and you have until New Year's Day to work out the answers. 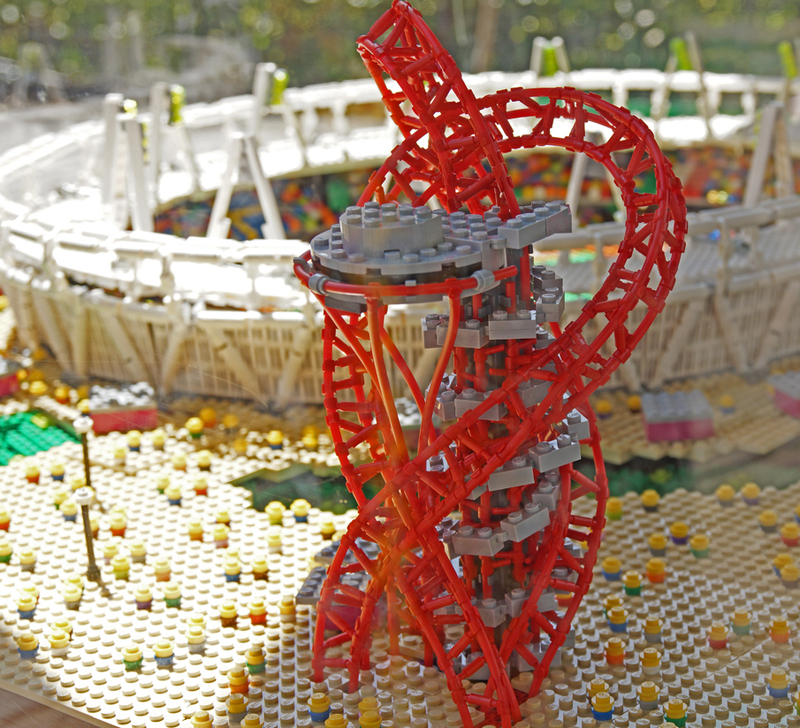 Look back on the London year with the Londonist Out Loud podcast. Finally, last posting dates have passed but there's still time to send new year wishes with a Christmas stamp. W W Heslop, Butchers were clearly very proud of being army contractors. I'm not sure that actually conveys an impression of quality, but perhaps it was meant to appeal to other large institutions rather than the ordinary passer-by. The shading on the lettering is very nice, though. If bulk-bought meat is not your thing, then here's a sweeter (if simpler) sign. 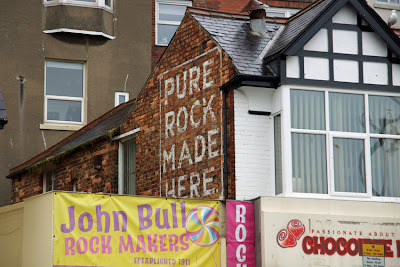 It's arguably not a true ghost sign, since rock is still being made and sold in the shop below. 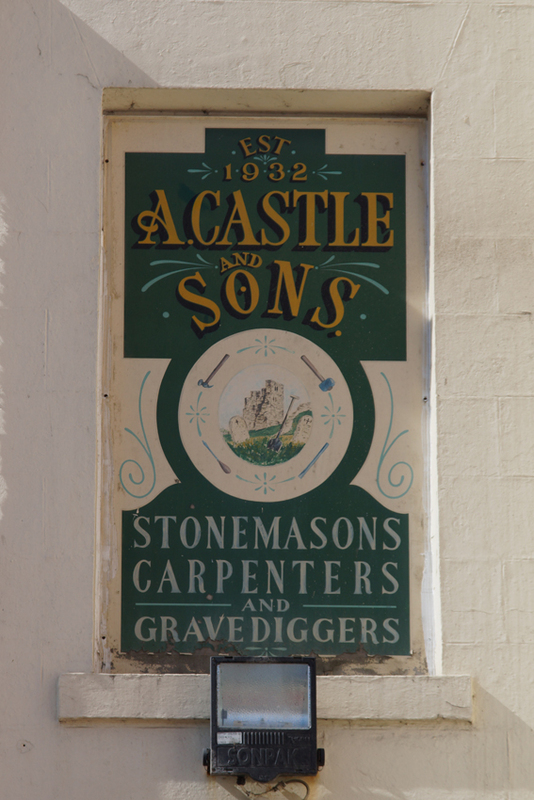 Further along the sea front is a rather sombre reminder: a sign for A Castle and Sons, Stonemasons, Carpenters and Gravediggers. It appears to have been repainted relatively recently, although I saw no signs of the original business. 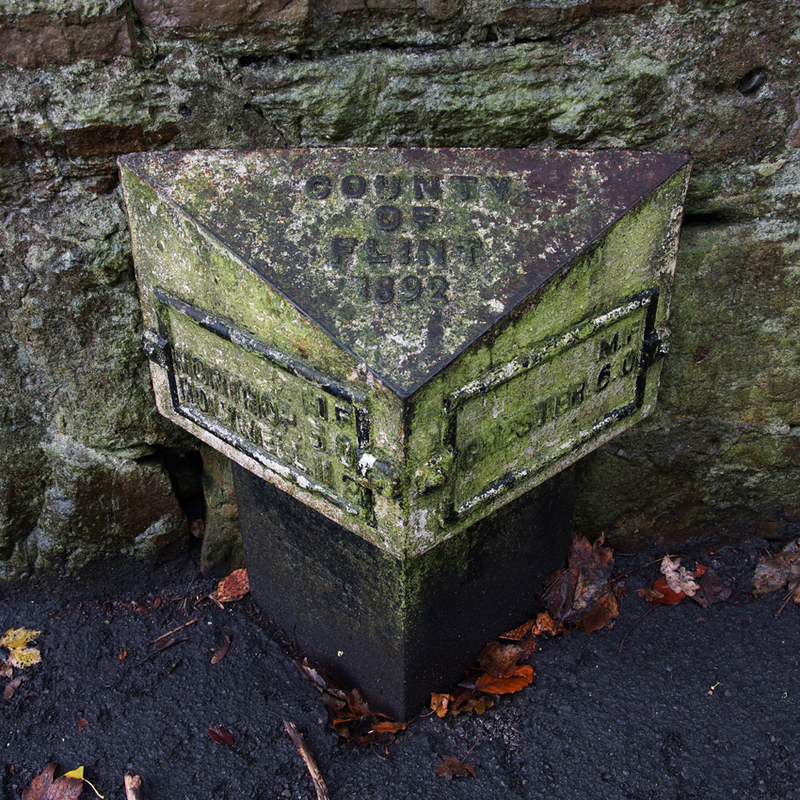 On the road from Hawarden, just over the Welsh border from Chester, is a cast-iron milestone. Although the sides are lichen-covered and not as clear as they should be, the top is still easily legible: 'County of Flint 1892'. 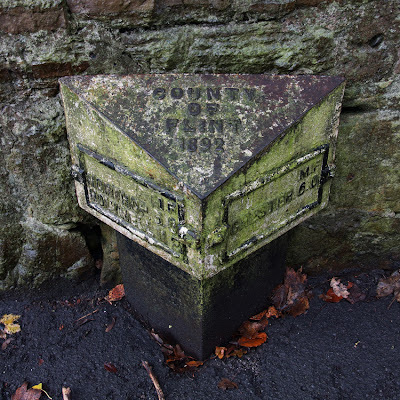 The Milestone Society describe a similar milestone, not far away in Halkyn, so it may have been a standard design. Frustratingly, although there appear to be foundry details on the base these are now illegible. Counties had been given responsibility for milestones in 1888. By this date, their importance had waned significantly. They were no longer needed for calculating postage, since there was a standard postal rate paid in advance using a stamp; turnpikes were less important now that trains had replaced coaches. Nonetheless, the County of Flint clearly saw a use for them and proudly added its name and the date to this example. Today, the cars speed by far too quickly for it to be read. But then, they probably don't need to know that Chester is precisely 6 miles 0 furlongs away - or that Northop is exactly 5 miles and Holywell 11 miles 2 furlongs in the other direction. The marvellously-named Peter Brusey Cow was born in Deptford in 1815. Although he would work in Chelsea and the City of London from the age of 15, it was to Deptford that he returned both to marry and to set up his first factory. Cow's early career had been in drapery, but he also had contact with Charles Macintosh & Co, known for their waterproof goods. In 1846, he accepted a share in the company's Cheapside branch and for a while, lived and worked at the premises. 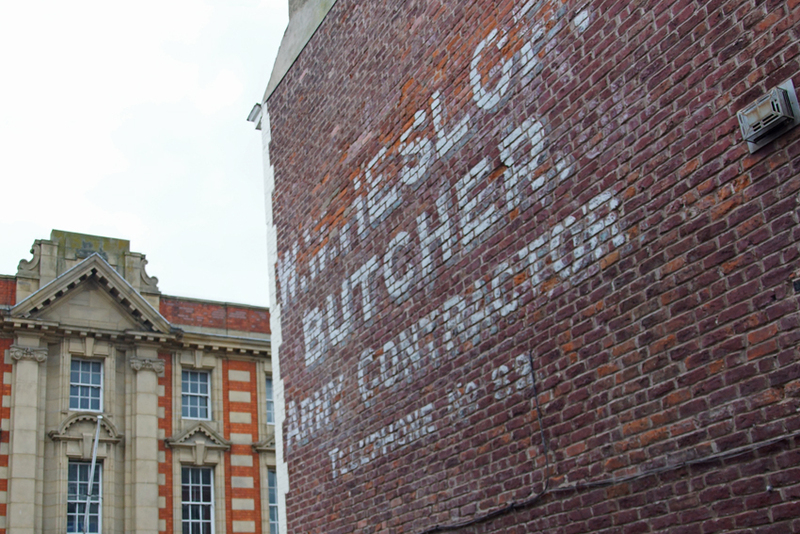 In 1850, he bought the Macintoshes' share for £4,000 and renamed the business P B Cow, Rubber Manufacturer. It was perhaps his early connection with the town, as well as its industrial activity, which encouraged Cow to open his first factory at Deptford Creek. He moved back there, along with his wife and five children. The year was thus a very busy one, because P B Cow also exhibited their waterproof tweed at the Great Exhibition in the Crystal Palace, winning an award. In fact, the company's move was so successful that larger premises were soon needed - meaning another move, to Streatham. Cow would live there until his death in 1890. Deptford's association with waterproof tweed was thus fairly brief, but fruitful. As for the company, it went on to create the Li-Lo inflatable air-bed as well as manufacturing a wide range of rubber goods from hot water bottles to air-sea rescue equipment. The latter led to the founding of the Goldfish Club: during the Second World War, the company heard from a number of aircraft crew who had been rescued in P B Cow dinghies after ditching in water. Its Chief Draughtsman 'Robbie' Robertson set up the club so that members could exchange experiences; the company gave financial backing. 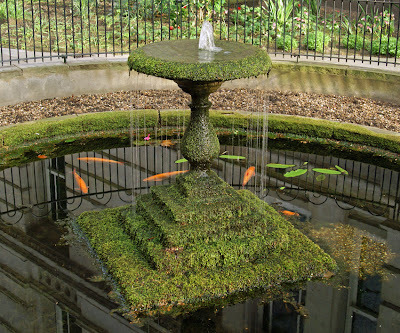 There were over 9,000 members by the end of the war and although the company's direct link to the club ended in 1947 when Robertson left, the Goldfish Club is still going strong today. For a little fresh air on a cold day, Postman's Park is ideal. This little green space sheltered by buildings manages to pack plenty of interest in a small area. There is a tiny fishpond, some rather nice planting and, at the entrance gate, a memorial fountain and an old, blue police call box. The main feature is, of course, the Watts Memorial to Heroic Self-Sacrifice which commemorates 'ordinary heroes'. Browse these wonderful (if tragic) Victorian stories, each so neatly encapsulated in a sentence that you don't have to linger longer than the weather allows. When you're ready to return indoors, leave by the St Martin's Le-Grand exit, cross the road, and take the escalator up to the Museum of London. 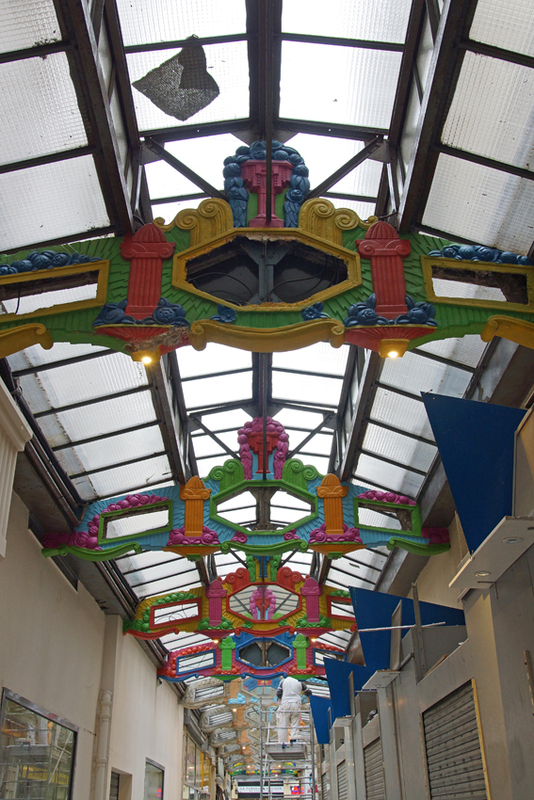 One of the highlights is the (indoor) Victorian street; admission is free. 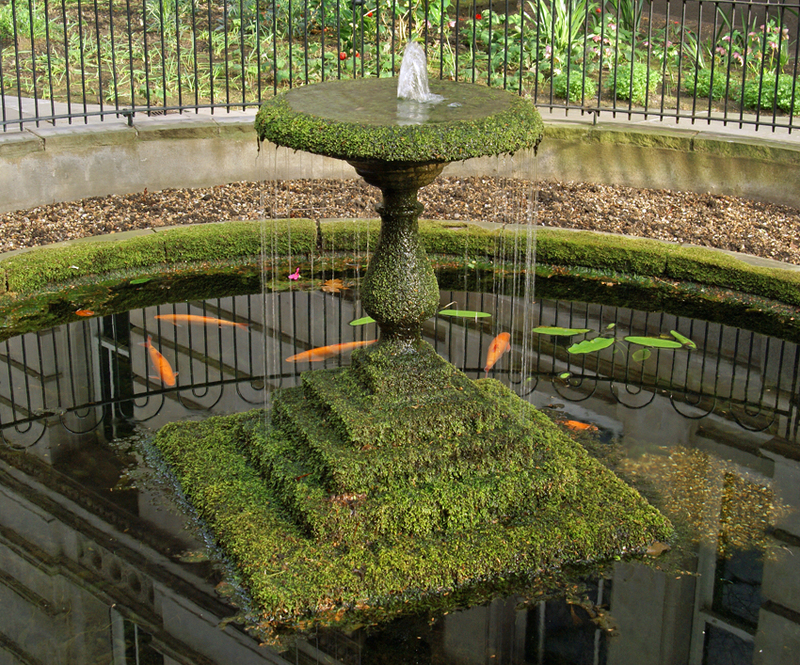 Having appreciated the atmosphere of the park, you can explore its stories further on my Postman's Park page. There are links to more detailed accounts of all the stories on the plaques. London is very cold just now, and while bracing fresh air is always good, you can have too much of a good thing! In order to make the most of the daylight, without risking frostbite, I shall be offering a few ideas for outdoor points of interest which are conveniently close to warm, indoor attractions with cafes. First is Yinka Shonibare MBE's work, Nelson's Ship in a Bottle. It originally appeared on the fourth plinth of Trafalgar Square, but now has a permanent home at the National Maritime Museum. 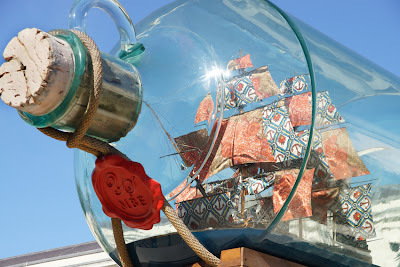 The ship in a bottle is a very traditional ornament, and this massively over-sized version has an equally traditional choice of subject: Nelson's HMS Victory. At the neck is a 'wax seal', featuring the artist's initials. However, this is not simply a very large version of an ordinary object. There are non-traditional elements too; in particular, the sails are printed with African textile designs. One of Shonibare's interests is post-colonialism, and the fabrics used here feature in much of his other work. He points out that while they are seen as traditionally African, they actually have a more complex, cross-cultural background. The fabrics are Dutch wax cloth, with patterns inspired by Indonesian designs; these particular pieces were made near Manchester. Shonibare's own history is similarly cross-cultural: born in London, he spent much of his childhood in Nigeria before returning to the city in his teens. Once you've admired the ship (and noted the vents for an air-conditioning system cleverly concealed in its plinth), look beyond it to Greenwich Park and the Royal Observatory. 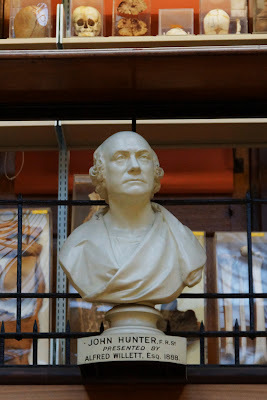 You can then walk into the National Maritime Museum to find out more about Nelson (and have a hot drink in the cafe). Admission is free. 60 years ago today, the 'Great Smog' enveloped London. To mark the anniversary of that miserable event, which killed an estimated 12,000 people, I'm republishing a post from 2010 telling the story of London's'pea-soupers'. New Cross Road has a lovely new coffee shop, London Particular. It even has its own London Particular blend of coffee. But where does the name come from? "Look out of this window, Watson. See how the figures loom up, are dimly seen, and then blend once more into the cloudbank. The thief or the murderer could roam London on such a day as the tiger does the jungle, unseen until he pounces, and then evident only to his victim." It's hard for those of us brought up with relatively clean air to imagine what these smogs were like. A thick yellow blanket of coal smoke mixed with damp air, they literally killed people. Even for those not choked by them, there was the terrifying experience of not being able to see vehicles, familiar landmarks, or the ground beneath one's feet. Londoners got lost, fell over, and relied on street lamps burning all day to help them navigate. The Victorian city had streetlights: the smog was what gave its darker side that ominous gloom. These fogs persisted into the twentieth century, as houses, factories, gasworks and power stations continued to burn coal. The Great Smog of 5-9 December 1952 killed 4,000 people in a matter of days, and perhaps three times as many in total. There was no escape: it made its way indoors, polluting rooms and causing or aggravating respiratory conditions. Some people also died from falling into the now-invisible Thames. Outdoors, people covered their noses and mouths with handkerchiefs or scarves. Performances were cancelled due to poor visibility and coughing audiences, road transport became impracticable, schools closed. At its thickest, visibility was so low that people couldn't see their own feet. Nickel in the Machine has a collection of photographs, with eye-witness accounts in the comments. Parliament was prompted to act, and the Clean Air Act 1956 marked the beginning of the end for the genuine London Particular. It lives on in benign form as a cultural reference, an evocation of Holmesian atmosphere, and a rather nice coffee shop. 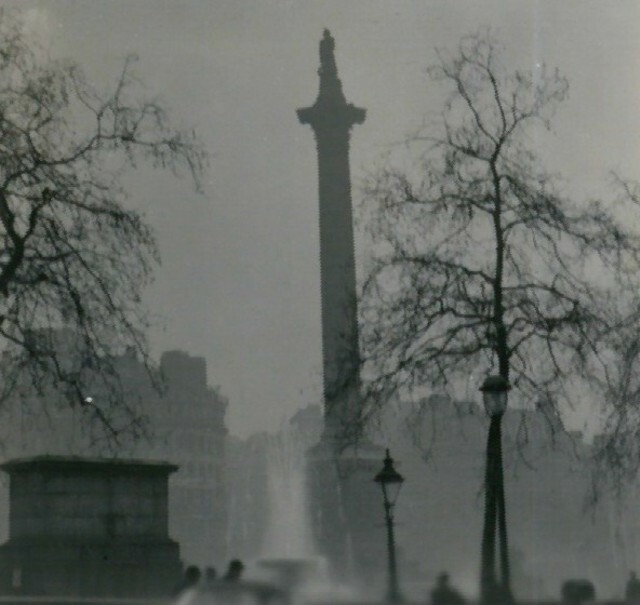 Image: Nelson's Column, December 1952, shared by N T Stobbs under a Creative Commons licence. 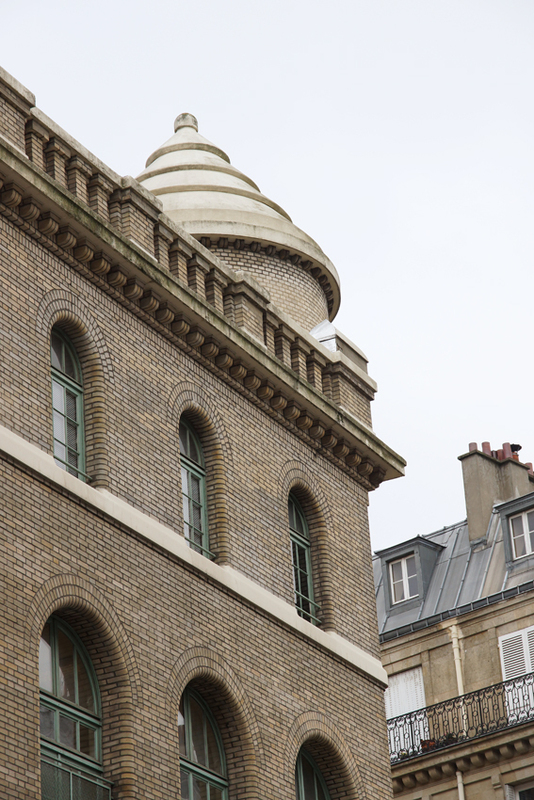 A wrong turn led to a chance discovery, as I happened across a rather special Parisian building. The Opera sub-station was the first of its kind for the Metro system, converting high-voltage alternating current into low-voltage direct current. The ground floor held the machines which converted the current, while secondary batteries (used to power both the machinery and the metro's emergency lighting) were on the first floor. They are linked by a spiral staircase still visible through the windows; the second floor is a later addition. 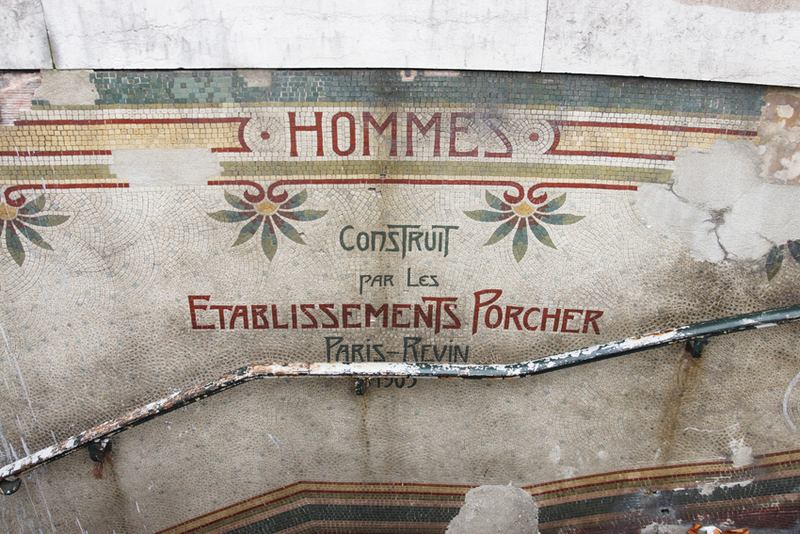 The building blends elegantly with its surroundings; even the mosaic sign looks more stylish than practical. 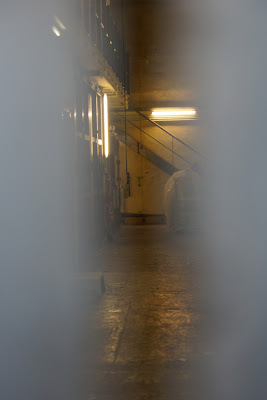 However, a peep through the grating confirms its industrial nature. The sub-station was the work of Paul Friésé, an outstanding industrial architect who had already designed several power stations. He built the sub-station in 1903 as part of the network's move to its own power supply. When the metro first opened in 1898 it took its electricity from other generating companies, but it was already building a power station at Bercy. That produced alternating current at 12,000 volts (direct current won't travel long distances). Since the network used direct current of considerably lower voltage, sub-stations were needed. 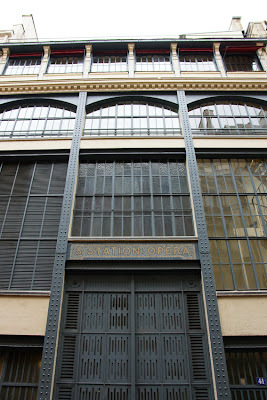 Friésé built both power station and sub-stations; prompted by my Opera discovery, I visited another example at Bastille. 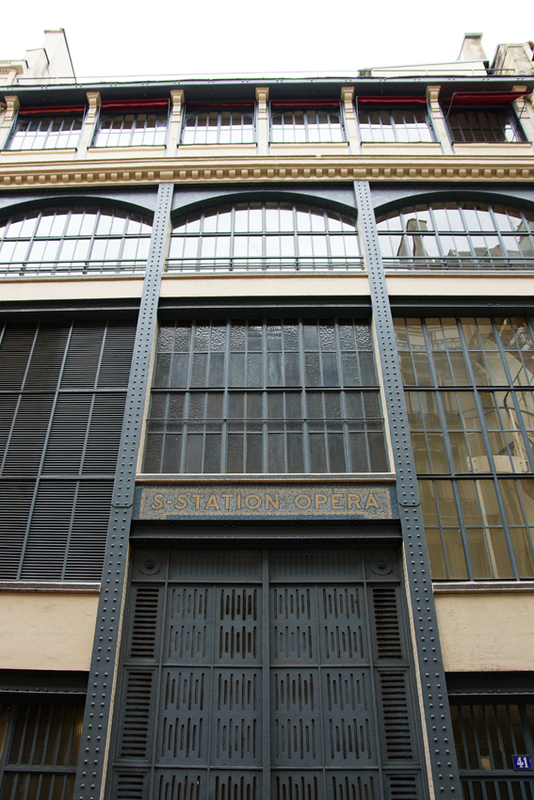 This sub-station, designed by Friésé in 1911, again fits stylishly into the cityscape. Its clever use of arched windows and occasional notes of whimsy, such as the turret at one corner, testify to Friésé's talent. With a new system in place, and such attractive housing for it, this should have been a golden moment for the metro. However, it coincided with one of its worse tragedies, the Couronnes disaster. On 10 August 1903, a short-circuit under a train caused a fire. The original flames were quickly put out and the carriages evacuated. The passengers moved into the next train, but when the burning train became unable to continue on its own, the second train was emptied of passengers so it could push the first down the line to the terminus. However, the damaged motor was still in contact with the live rail: there was no way of disengaging it. 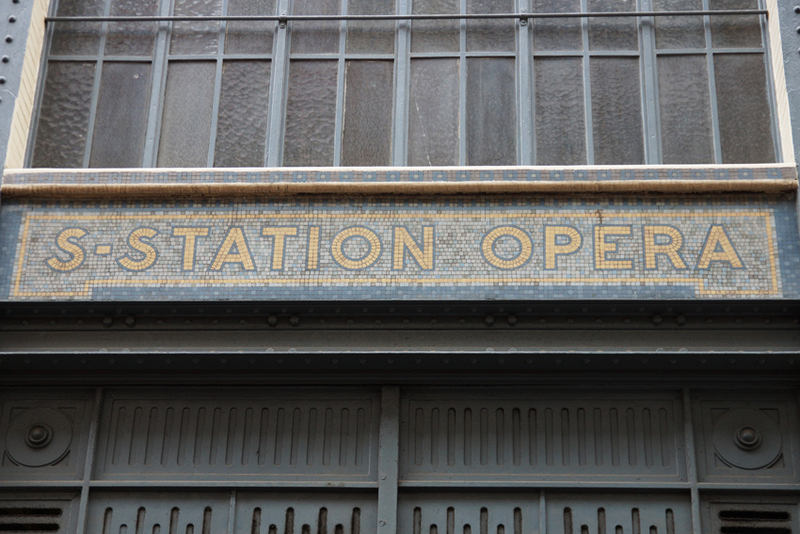 The fire re-erupted at Menilmontant station and this time, it could not be brought under control. Meanwhile, the two trains' passengers had got into a third train, which now stopped in Couronnes station. The passengers were told to leave both train and station, but there were problems. First, the crowd (many of whom were now extremely fed up at being forced to leave three trains in turn) stopped to argue about fare refunds. Secondly, smoke from the tunnel suddenly began to fill the station. In an attempt to avoid it, many moved away to the far end of the platform - which had no exit. Matters were made worse by lack of light as the power supply failed. When firemen were finally able to enter, they found 84 asphyxiated bodies - 75 at Couronnes, the others at Menilmontant or in the tunnel. The disaster led to fundamental changes designed to improve safety. These included the provision of emergency lighting, clear signage, and emergency exits. Drivers' cabs were built of metal instead of wood, so they would catch fire less easily. The provision of power to the trains was also reviewed, in particular so that the supply to sections of track could more easily be cut altogether. 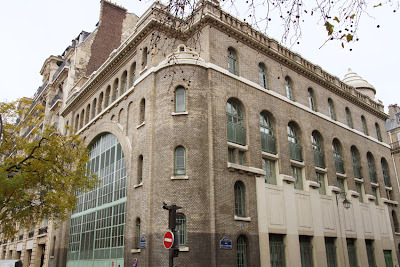 In this atmosphere, the reassuring appearance of Friésé's buildings on the city's streets must have helped to restore shaken public confidence in the new transport system. As for Friésé himself, his architectural work ended when, aged 63, he enlisted as a military interpreter at the outbreak of the First World War. He was wounded on the western front and died of his injuries in 1917. His buildings are no longer operating as substations, but continue to be used by the metro system. Further reading: there is a detailed account (in French) of the Couronnes disaster here. My attempt to visit Paris's Art Nouveau public toilets, alongside the church of La Madeleine, was foiled as they have now been closed. Although they are listed buldings, the city sealed them off with metal gates as a cost-cutting measure. How lucky that my visit was motivated by curiosity rather than desperation! Even more luckily, there was some compensation: the extravagant murals at the entrances are still visible. 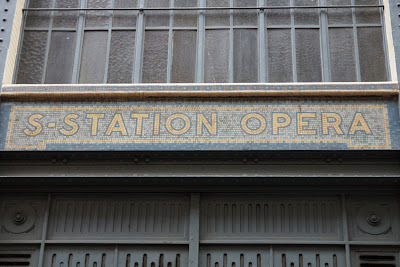 As the tiles boast, the toilets opened in 1905. They were the first such conveniences in France, copying London facilities operating since the previous century. Inside were mahogany doors with stained glass panels, opening into generously-sized cubicles with washbasins; there was even a shoe-cleaning seat in the middle of the room. The automated 'sanisette' cubicles which replace all that luxury seem a very inferior alternative. 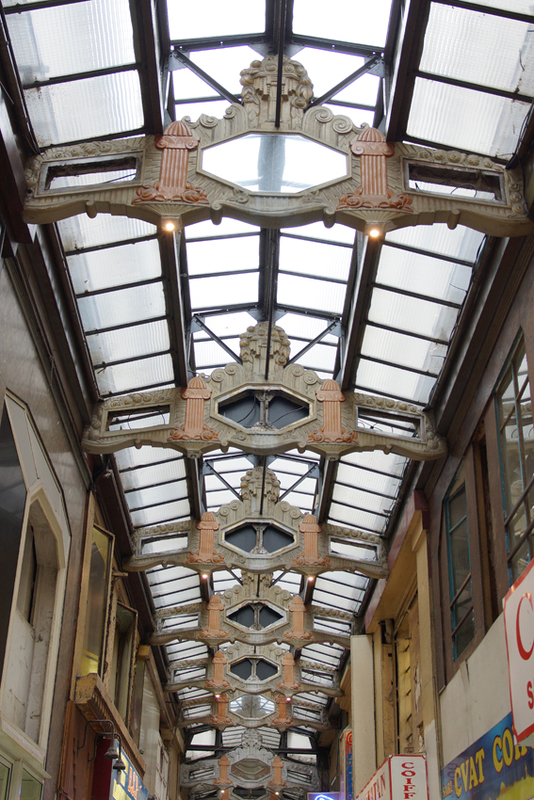 I love the passages couverts in Paris - all sharing the same concept of an arcade of shops with a glass roof, but each with its own character. While some have retained or recovered their high-class atmosphere, others are shabbier - and often livelier for it. 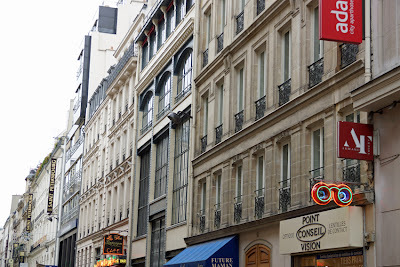 The most elegant passages can feel as if they have been preserved in (very appealing) aspic, but there's no such sensation in the Passage du Caire, full of fashion wholesalers, or the Passage Brady, known for its Indian restaurants and shops. The Passage du Prado has been the poor relation even among these more timeworn arcades. Although one of the most venerable passages in the city, it was only roofed with glass in 1925. 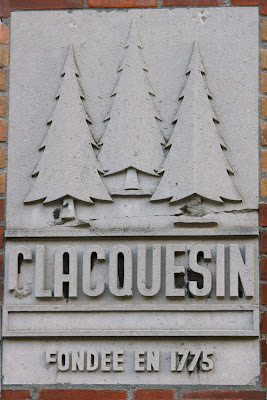 As a result, it has some good Art Deco features, although they are easily missed among the nail salons and snack bars. However, partly in response to concerns that this arcade had become a dangerous and crime-ridden place, it is currently undergoing renovations: the floor is being replaced and at ceiling level, there is some rather colourful repainting going on. I very much doubt these are historically accurate shades, but they do a wonderful job of drawing they eye to some of the details which make Paris's passages so special. 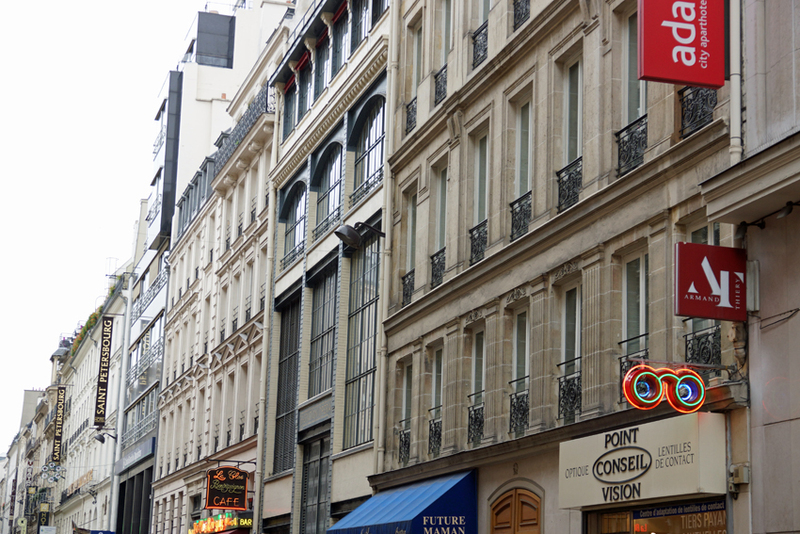 Visitors to Paris tend, unsurprisingly, to focus on the city centre. However, as with London, the outer districts are full of interest too. For example Malakoff, an unassuming neighbourhood just across the Peripherique ring road, has some fascinating history. Before the 1850s, this area was mostly taken up by quarries so the land was of little value. However, speculator Alexandre Chauvelot saw an opportunity and purchased 18 hectares. 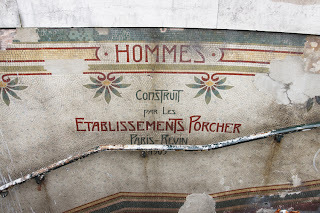 He sold it in small parcels of land to working-class Parisians, many working on Haussmann's elegant transformation of central Paris. Building with the finest stone from local quarries by day, they constructed their own small homes from the cheapest. 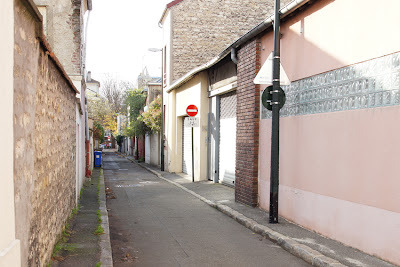 Chauvelot (and the fellow speculators who soon joined him) didn't waste potential building land on wide roads, so the original streets are joined by narrow passages. Although the early houses have gone, the street layout survives. Why call the town Malakoff? Because as well as housing, Chauvelot invested in a Crimean War theme park which opened in 1856, offering a restaurant, dancing and bars. Malakoff was a decisive battle, fought over the tower of the same name in Sebastopol, and the park centrepiece was a replica Malakoff Tower. It was 50 metres high, decorated with portraits of combatants, and housed an exhibition on the war - which had ended only the previous year. (Given that spectators had taken picnics to watch the Battle of Alma, it is perhaps not surprising that Chauvelot seems to have been untroubled by concerns about good taste.) Initially the park attracted up to 12,000 visitors on Sundays, but when Chauvelot died in 1861 it went into decline. By 1871, the tower was a liability because of its potential use by the Prussians besieging Paris. It was demolished, leaving the street name 'rue de la Tour' and the name of the town as reminders. 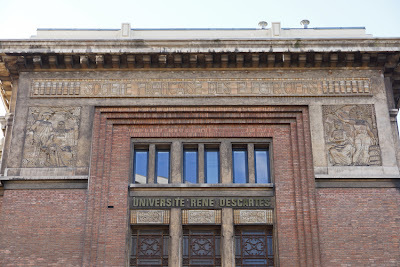 The law faculty of Paris Descartes University now occupies the former École Supérieure d'Électricité. 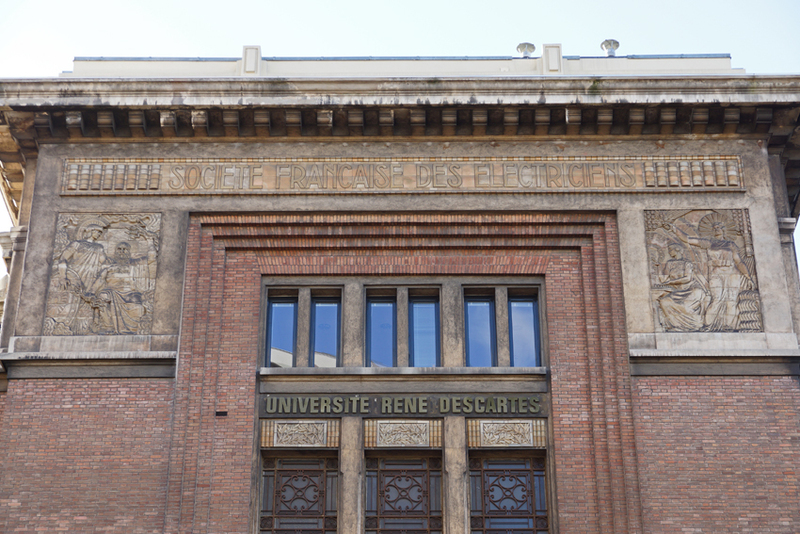 The building, opened in 1926, proudly bears the name of its former occupant - a prestigious postgraduate school of engineering. It has a place in technological history: the first French television demonstration was given here in 1931 by René Barthélemy. The 30-line image transmitted from nearby Montrouge showed his collaborator Suzanne Bridoux, who thus became the first French television presenter! The following year, the PTT (French post office, also responsible for telegrams and telephones) began broadcasting and by 1935, Barthélemy's channel was making daily broadcasts using a much improved 180 lines. There were only a hundred French television sets available to receive them; by the time of Barthélemy's death in 1954, there were around half a million. 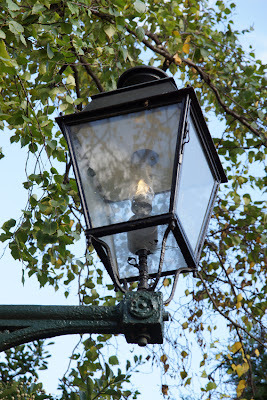 Tucked away on a footpath is the (locally) famous Leon the lamp which has its own preservation society. 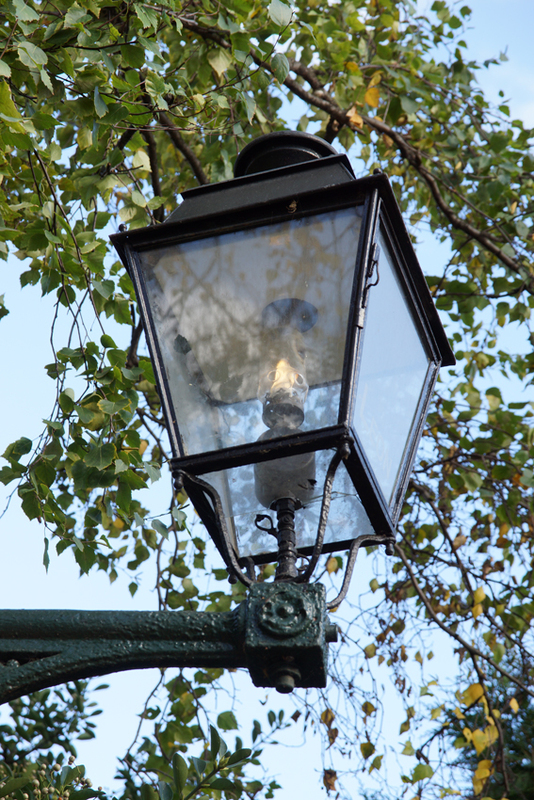 It's the only lamp in Ile de France to have remained continuously gas-powered since its installation in 1925. 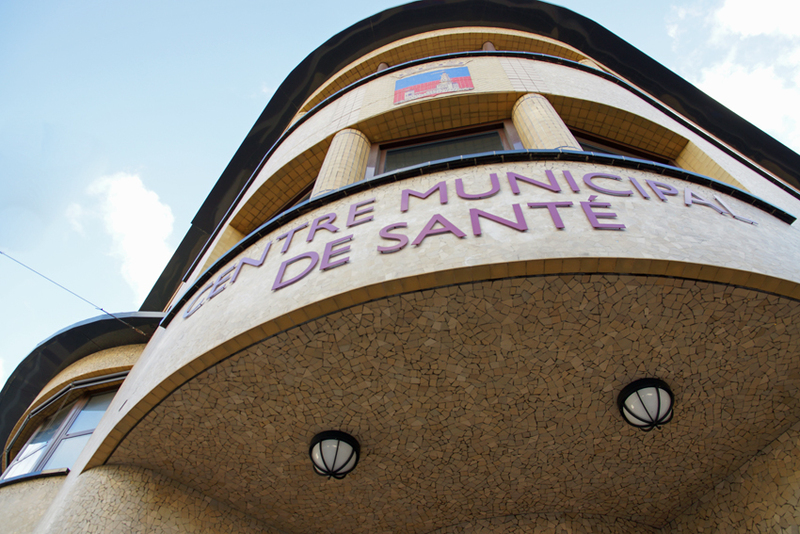 The arrival of street lighting was part of a larger project to improve amenities in the town - roads were also paved, sanitation installed and municipal buildings constructed. This surge of activity was followed by the construction of a health centre in the 1940s. 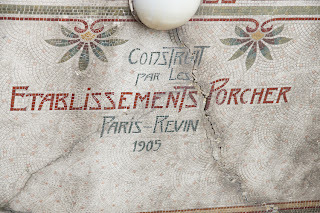 My interest in ghost signs has led to a related interest in French liqueurs, which account for a high proportion of the faded advertisements on France's walls. I haven't yet seen one for Clacquesin, but it was nice to find out about this 'medicinal' drink which used to be distilled in the town. It doesn't contain the near-ubiquitous quinquinoa, but is based on pine resin - as the logo illustrates - combined with 32 plant extracts including cinnamon, cloves, lemon, orange and juniper berries, all sweetened and coloured by caramel. The distillery was established in 1860 and moved to its current premises in 1903. Pauline Clacquesin, the wife of its founder Paul, was highly skilled at publicity - using everything from radio and wall adverts to promotional city maps and calendars, to endorsements from Tour de France cyclists. The aperitif was hugely fashionable in the 1920s, a favourite of stars including Josephine Baker. Forbidden during the Occupation, it suffered a further blow with the death of Pauline Clacquesin in 1942, and didn't recover in the post-war years. It is now being made again at a new site by the great-grandson of its founders; the original stills and equipment remain here, and the premises are used as an events venue. 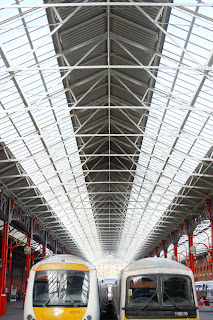 After all, this fascinating place is just a short metro ride from the centre of Paris. 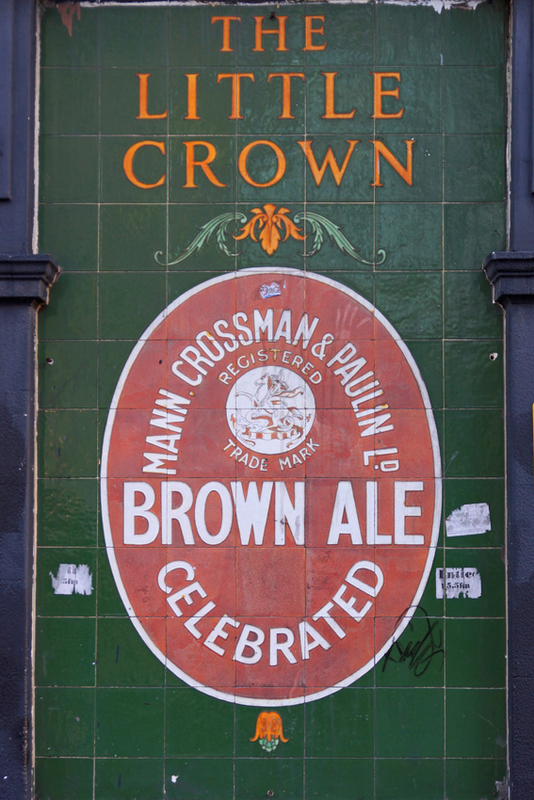 The Little Crown pub in Rotherhithe has been closed for years, but still sports this rather nice tiled sign. 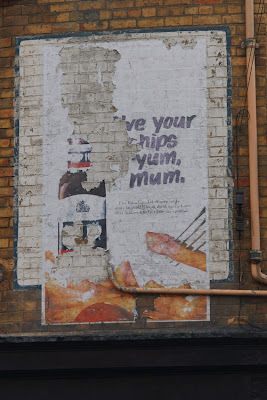 It's not just a reminder of happier drinking times inside, but also a relic of London's brewing history. The brewery was on Whitechapel Road - its 1880s building survives, with the name still curving over the gateway. Known as the Albion brewery, it had been founded in 1808 by the landlord of the nearby Blind Beggar pub. John Mann and Philip Blake bought the lease in 1818; after Blake's retirement, the brewery was run by Mann alone until 1846. The name then changed to recognise his new partners, Robert Crossman and Thomas Paulin. When Burton ales became fashionable, the company opened a brewery in Burton on Trent - before realising that London water would also work and returning all production to the capital in 1896. They even added a bottling plant - and as one of the largest brewers in the country, they became a public company in 1901. Mann's Brown Ale was created by head brewer Thomas Wells Thorpe in 1902 and became their most popular product by the mid-twentieth century. It was the first beer of this sweeter style; other beer companies would follow, especially when brown ale became popular in the 1920s. In 1958, Mann merged with Watney's to form Watney Mann, before being bought by Grand Metropolitan in 1972; the Albion brewery closed in 1979. The Mann's name lives on, however, with Marston's (who, coincidentally, had bought the lease to Mann's Burton brewery over a century ago) still brewing brown ale to its original recipe. Our sign, then, evokes a major London brewer, firmly rooted in the East of the city. It dates from before 1958, reminding us of a time when the now-closed pub with its boarded windows was still a living part of the community. My very occasional series on interesting signs, increasingly misnamed as 'signposts', is back with a London example. 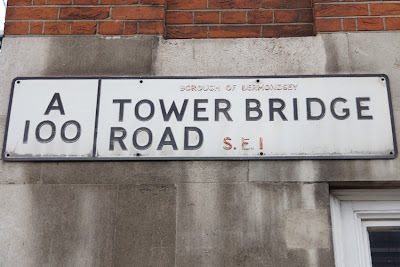 This sign is on the south west corner of Tower Bridge, reminding us that the landmark is also part of the A100 road. The system of letters and numbers designating certain roads was a side-effect of road and petrol taxes. With motorists now providing money for roads to be maintained, the government needed a way of identifying those roads and indicating which were busiest. Originally designed for Ministry of Transport use, the numbering system also promised to be a useful way for drivers to navigate the road system so it was released to the public in the 1920s. There are other surviving reminders of this now-defunct borough, including a film promoting its activities. As wonderful as the social history it contains is the revelation that the council had departments known as 'Health Propaganda' and 'Gardens and Beautification'. Further reading: for all things UK road-related, including more on road numbering, visit the wide-ranging CBRD site. First, the Bile Beans ghost sign in York has been repainted. It had already been painted in the 1980s, a restoration which was controversial at the time. That controversy has now been reignited: York Stories has an excellent account. Finally, Sam's own book has just been published. It looks at the Hand-Painted Signs of Kratie in Cambodia, where he has lived for several years. This book is a fascinating insight into the style of the signs and the process of producing them; it also analyses their wider context in the history of the city and the country. Well-illustrated, it's a wonderful exploration of the advertising culture of Cambodia, and gives an international perspective to hand-painted signs. Set into the pavement in Russell Square is a rather tempting sign. 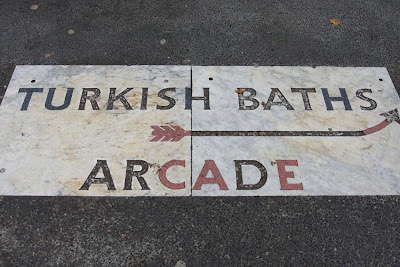 Warm, relaxing Turkish baths; a marbled sign promising luxurious surroudings; and a rather fetching arrow pointing the way. Who could resist? 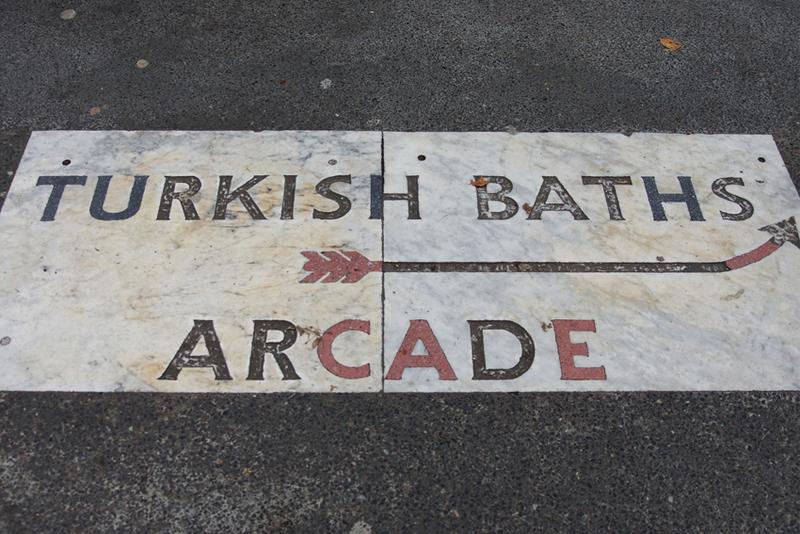 Don't attempt to follow it, though, as the baths no longer exist. They were part of the Imperial Hotel, designed by Charles Fitzroy Doll, who was also responsible for the nearby (and surviving) Hotel Russell. 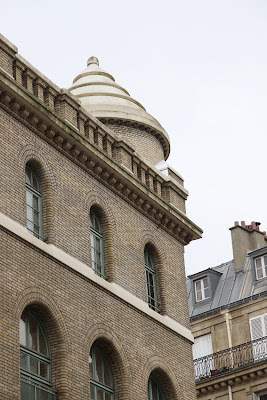 Part of an extension to the building, the baths opened in 1913. 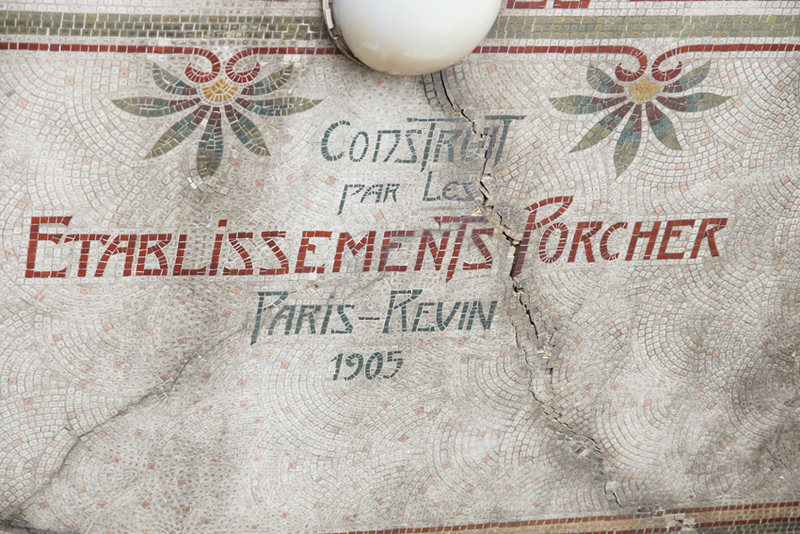 An early photograph shows an opulent interior, the walls and ceilings heavily decorated, the floor of mosaic. It more than lives up to the promise of its sign. A later advertising brochure for the hotel claimed its bath as 'Finest in the World', open to non-residents for a rather pricy three shillings and sixpence. Not only were they open 'day and night', but there was a wide range of other treatments including Russian vapour baths, Vichy douches, electric light and ultraviolet ray baths and electric treatments. Sadly, the hotel and its baths were demolished in 1966. Statues from the baths now line the car park entrance; otherwise, all that remains is this sign, tempting and taunting the passer-by. 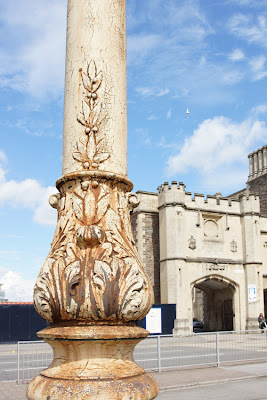 On the road outside Temple Meads Station in Bristol is a fine but neglected piece of street furniture. At first glance, I thought it was a stinkpipe as there are no fittings at the top. 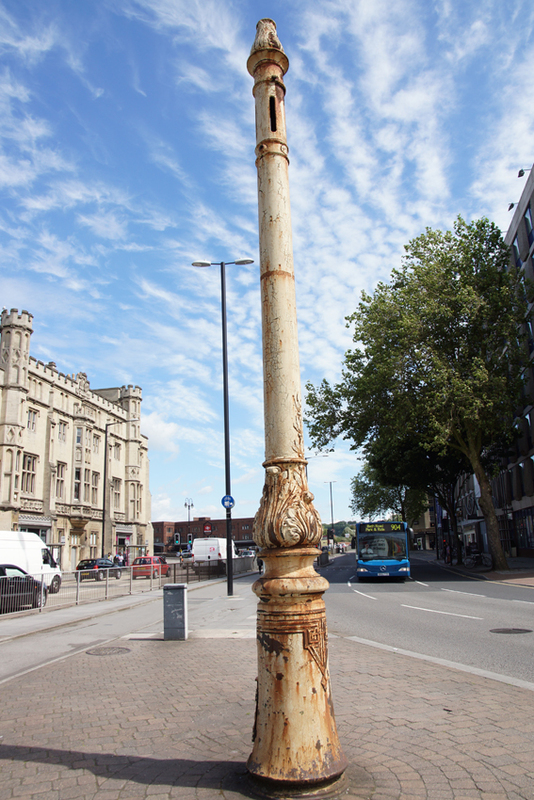 A second look suggested that this is in fact a lamp post - albeit one now missing its lamp. 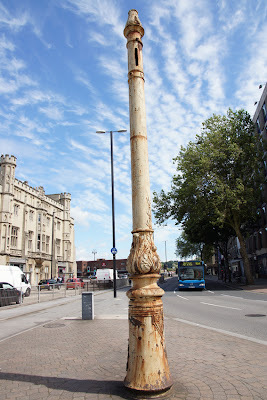 However, further research led to the information on Flickr that it is in fact a tram pole. Indeed, there's a photo of it in use here. The decoration on the pole is rather good. 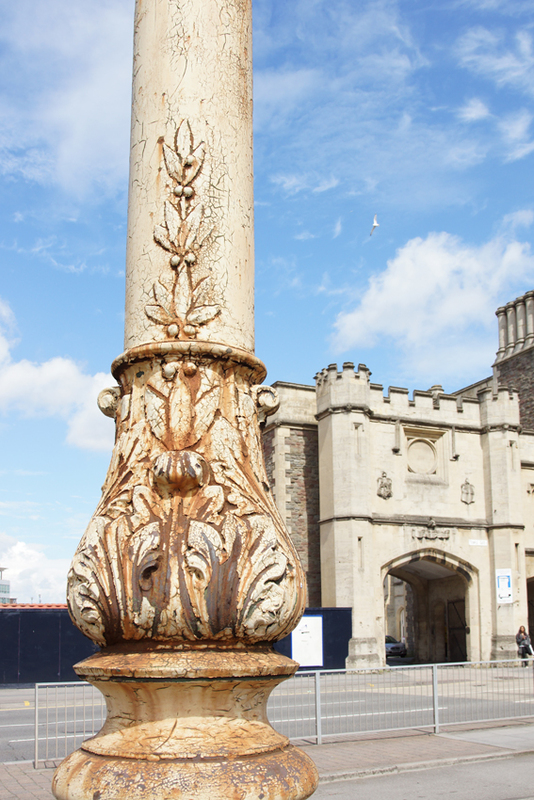 As well as some very nice leaves and berries around the column, there is a more geometric design at the base. The rust may speak of a lack of care, but it does also highlight some of the detail. In the late 1930s, it was decided that the extensive tram network should be closed in favour of bus services. In fact, it continued to operate until its power supply was destroyed during bombing of the city in 1941. The trams are now largely forgotten: a sad contrast to the large celebrations which had marked their opening. Likenesses of Admiral Blake, a prominent Parliamentarian during the Civil War, can be found on Deptford Town Hall and on the facade of the old naval hospital in Greenwich. 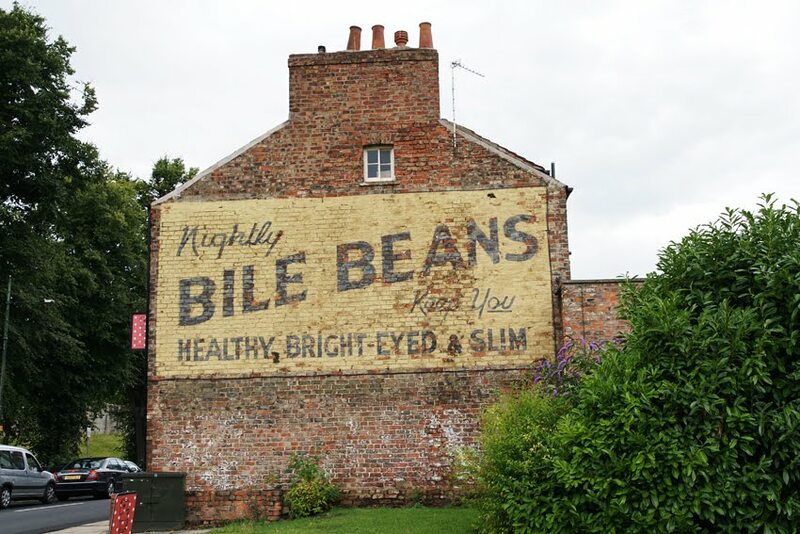 However, reminders of his life are most prolific in his home town, Bridgwater. 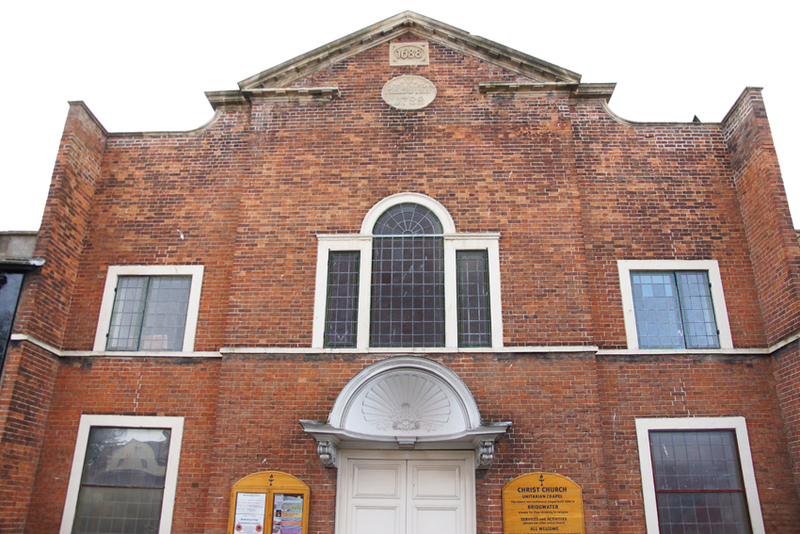 As well as his statue, the Blake Museum, and various buildings named for him, there is a plaque on the wall of the Unitarian Chapel where his protege preached. Its early fate was closely tied to England's political conflicts. In 1662, the Rev John Norman was ejected from the parish church: a consequence of the restoration of the monarchy two years earlier. Like Blake, he had been a Parliamentarian, and so the admiral's friends rallied round to create a new congregation. 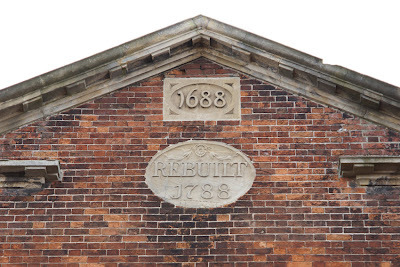 Their chapel was destroyed by the authorities in 1683, shortly before the Monmouth Rebellion, but was rebuilt again and the building still bears the date 1688. A large preaching academy was also associated with the chapel. 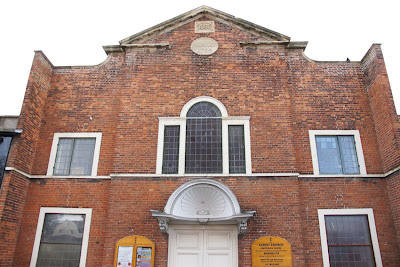 The current building, however, dates from 1788 as another, rather more florid panel attests; around this time, the mayor and other local corporation members worshipped here. 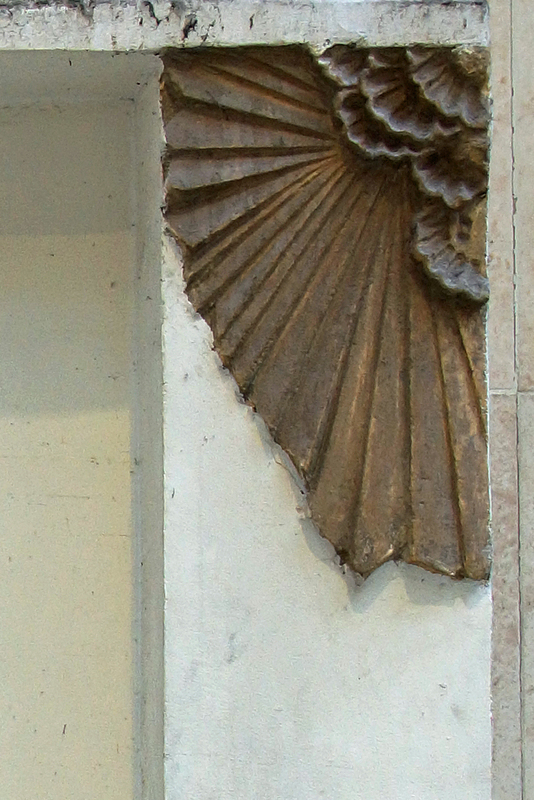 (The shell-shaped hood over the door is from the 1688 building.) The chapel became Unitarian in 1815. A schoolroom was added to the back in the nineteenth century. The building has other famous connections: inside, a plaque commemorates George Lewis Browne, who fought under Nelson at Trafalgar and brought his body back to England. Another plaque outside records that poet Samuel Taylor Coleridge, who lived for a while in the town and nearby Nether Stowey, preached here twice in 1797 and 1798. When the Locomotives on the Highway Act 1896 was passed, it dramatically changed British motoring: no longer did cars have to be preceded by a man carrying a flag. 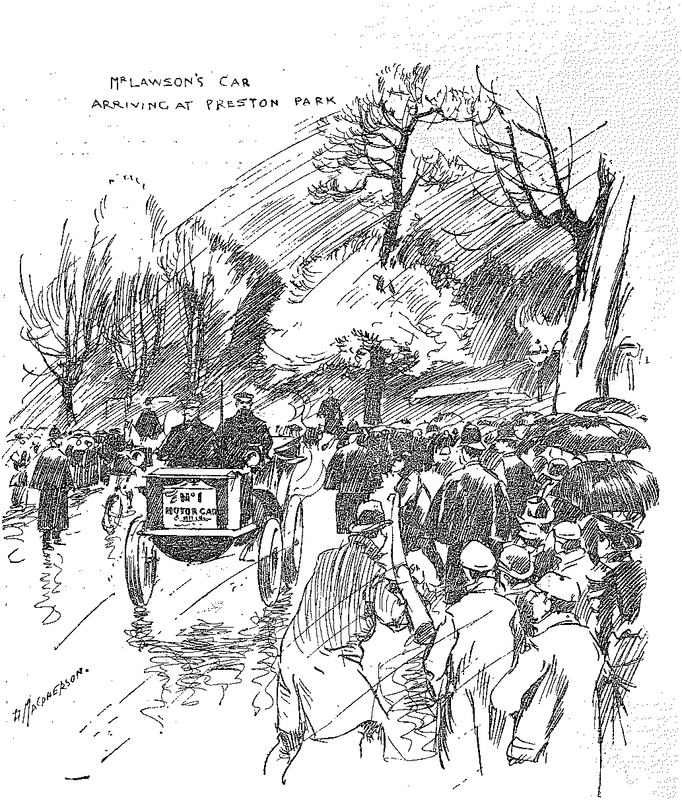 To celebrate, the first London to Brighton Run took place - an event now repeated annually by pre-1905 vehicles. 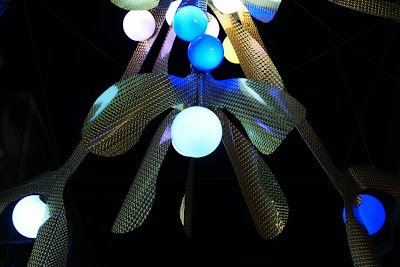 The day before they depart, a selection are exhibited on Regent Street. 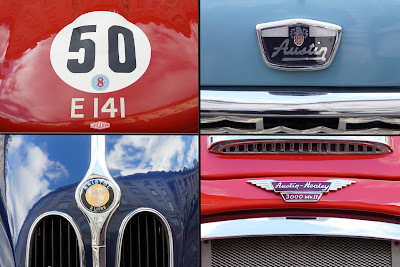 I've visited before, and returned this year to admire and photograph the cars. As for the run itself, images of the original event were published in the Daily Graphic. 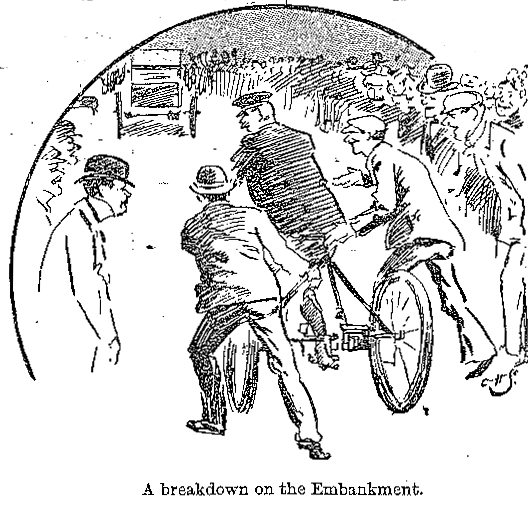 There's a gently humorous picture of a breakdown - the motorised tricycle was still on the Embankment at the beginning of the run! Luckily, there were plenty of willing hands to give it a push, as the event was watched by 'tens of thousands' of Londoners, sometimes up to nine or ten deep on the roadside. Less fortunately, the masses of onlookers slowed progress so that a number of engines overheated. 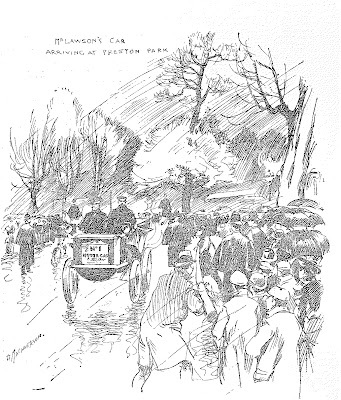 Only after Croydon 'when the open country was reached ... the keen, excited throng gave way to straggling onlookers'. 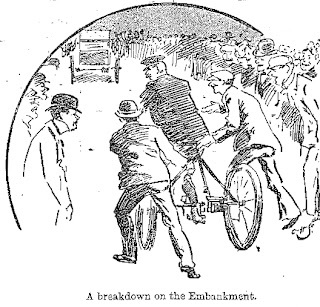 Nonetheless, the Graphic's special reporter - clearly something of an enthusiast himself, and having thoroughly enjoyed his own drive as far as Reigate - concluded that 'the demonstration was a brilliant success.' He ended the article with an accurate prediction for the future. The industry, it is quite obvious, is only in its infancy. An intense amount of experimental work has yet to be done before an entirely satisfactory vehicle can be put upon the market, but enough has already been done to make it clear that a reasonably perfect motor will be with us in the near future, although possibly it may not be in the least like any of those that were used on Saturday. The Daily Graphic report comes from an original copy of the newspaper, kindly sent to me by historic newspapers. They have an amazing collection of regional and national newspapers, with some dating back to the seventeenth century. As well as providing various gift options for birthdays and anniversaries, historic newspapers also have a historical research team. I was very impressed by the condition of the newspapers, as well as the gift box and tissue wrapping in which they were packaged. They have very kindly provided a discount code: 15TODAY. It can be redeemed against any of their original newspapers. 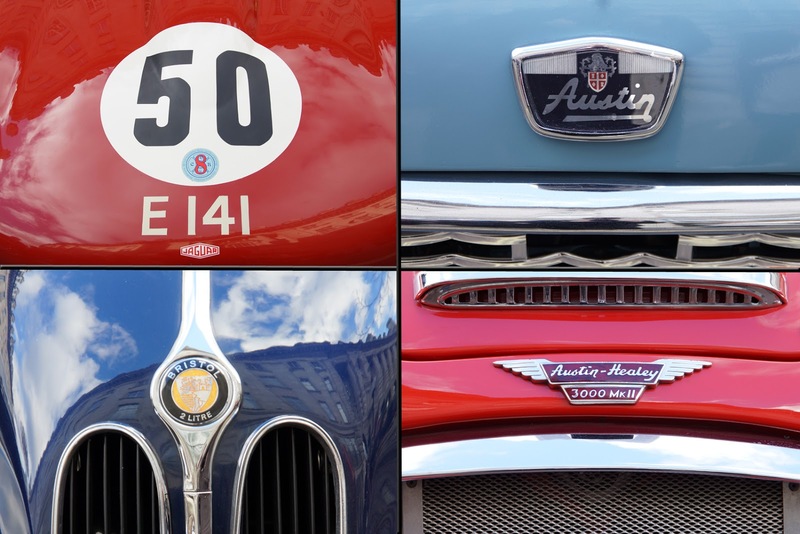 There's an irony in Regent's Street being closed to traffic for a motor show but, that aside, this annual event is rather good even if you're more into history than motors. It coincides with the London to Brighton Run, and has a display of some of the pre-1905 vehicles taking part (on which, more shortly). 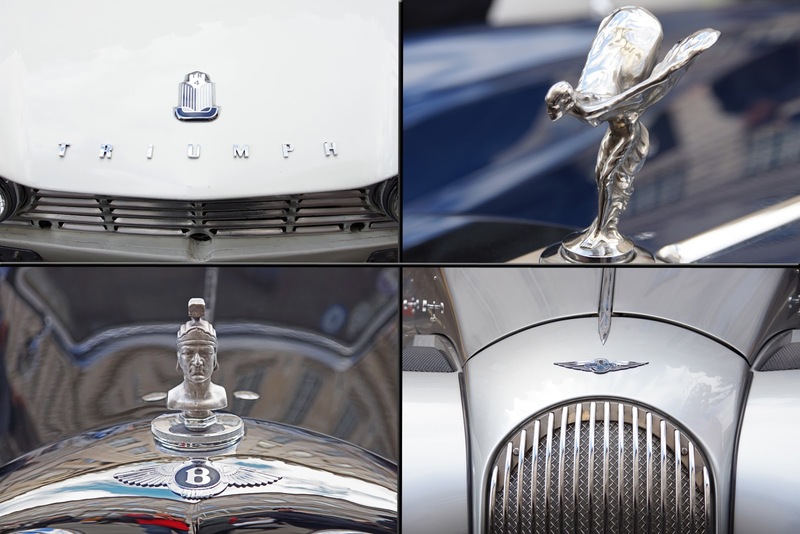 There were also some more modern vintage vehicles on show this year in the 'Best of British cars': here's a selection. As usual, click the images to enlarge. The grand name of the Great Central Railway might suggest that it achieved lofty things on long-distance routes. However, as is often the case, the boast contained in the name was never really matched in reality. 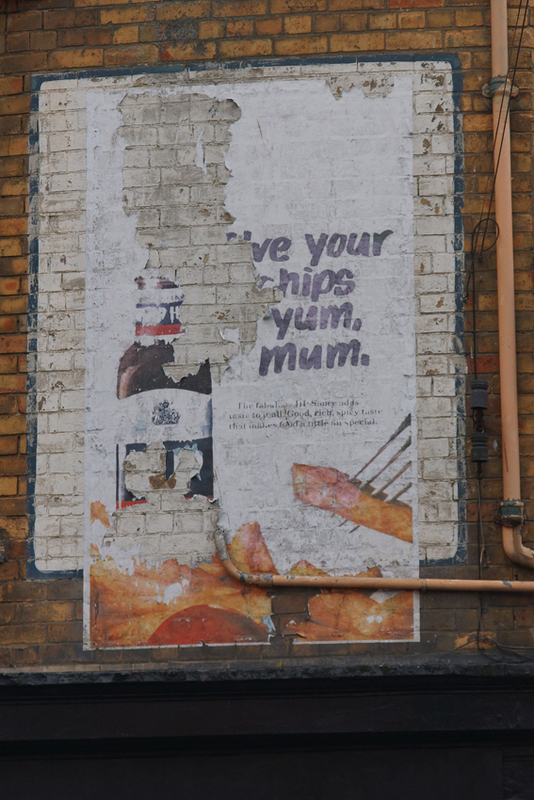 Nonetheless, it has left a permanent mark in London. Marylebone Station was formally opened on 9 March 1899 (with services beginning on 15 March) - the last of London's mainline terminal stations. Lines from the north were not allowed to have termini further south than Euston Road, hence the famous alignment of King's Cross (1852), St Pancras (1868) and Euston (1837) along the north edge of that thoroughfare. 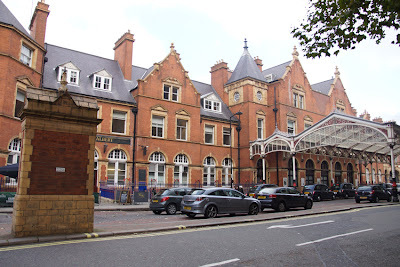 It continues west as Marylebone Road, with Paddington Station (1838) at its end; but after all these had been built, there was resistance to further stations in central London. After much effort, the Great Central Railway were allowed to open their new terminus. The difficulties were wryly acknowledged in a speech by C T Ritchie MP, head of the Board of Trade: He imagined that there was no railway which had had to overcome so much Parliamentary difficulty as the Great Central Railway. These trains were made up of the new and luxurious stock which the company has had constructed for the purposes of the new line. The carriages, which all have corridors giving free passage along the whole length of the train, run upon four-wheeled bogies, and are fitted with Gould's vestibule and automatic coupler, Gresham's direct system of steam heating, communication between passenger and driver and guard by means of the automatic vacuum brake, and electric communication between passengers and attendants. Every effort has been made to reduce oscillation as far as possible, and the smoothness of running attained is a tribute to the design of the coaches as well as to the excellence of the permanent way provided by the engineers. All the carriages, whether first-class or third-class, are handsomely decorated and comfortably fitted, practically the only differences between them being the more elaborate adornment of the former and the rather greater elbow room allowed to the passenger who has paid the higher fare. The dining-cars of both classes are lighted by electricity supplied from dynamos driven from the axles, while the other carriages are provided with Coligny lamps burning oil gas. All these carriages ... are painted in the new colours which the Great Central Railway has adopted for the exterior of its stock, the upper panels being French grey and the lower ones brown, varnished and picked out with gold lines and emblazoned with the company's new coat-of-arms. The new line ran from Nottinghamshire to London, and was intended to provide a fast connection between the Manchester, Sheffield and Lincolnshire Railway's services and London. When their London extension was about to open, the MS&LR change its name to the Great Central Railway to reflect this national coverage. 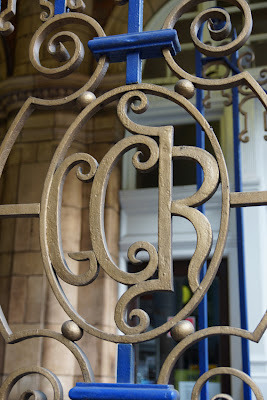 The initials GCR can still be seen in Marylebone's decoration. In fact, financial success was initally elusive - not helped by the line costing triple its £3.5 million budget - and the line eventually ended up carrying more freight than passengers. One intriguing aspect of the company's fortunes is that in building the line, they had carefully taken account of future compatibility with European trains. The company chairman Edward Watkin was also on the board of a French railway company, Chemin de Fer du Nord, and was behind a scheme to build the channel tunnel. He therefore envisioned the line being part of a railway network extending far beyond Britain. * However, the tunnel project was later abandoned as a potential threat to national security and would only be completed in 1994. 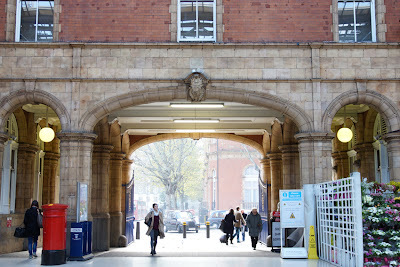 Most of the Great Central's route was closed by Beeching in the 1960s, and today Marylebone is the terminus for Chiltern Railways which goes only as far north as Birmingham. The Times report comes from an original copy of the newspaper, kindly sent to me by historic newspapers. They have an amazing collection of regional and national newspapers, with some dating back to the seventeenth century. As well as providing various gift options for birthdays/anniversaries, historic newspapers also have a historical research team. I was very impressed by the condition of the newspapers, as well as the gift box and tissue wrapping in which they were packaged. * Thank you to Alan Burkitt-Gray for providing this information in his comment below. 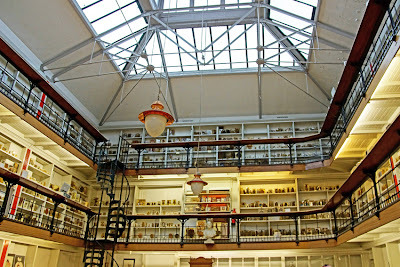 The Pathology Museum at St Bartholomew's Hospital is not generally open to the public, although it does hold special events including an interesting seminar programme. 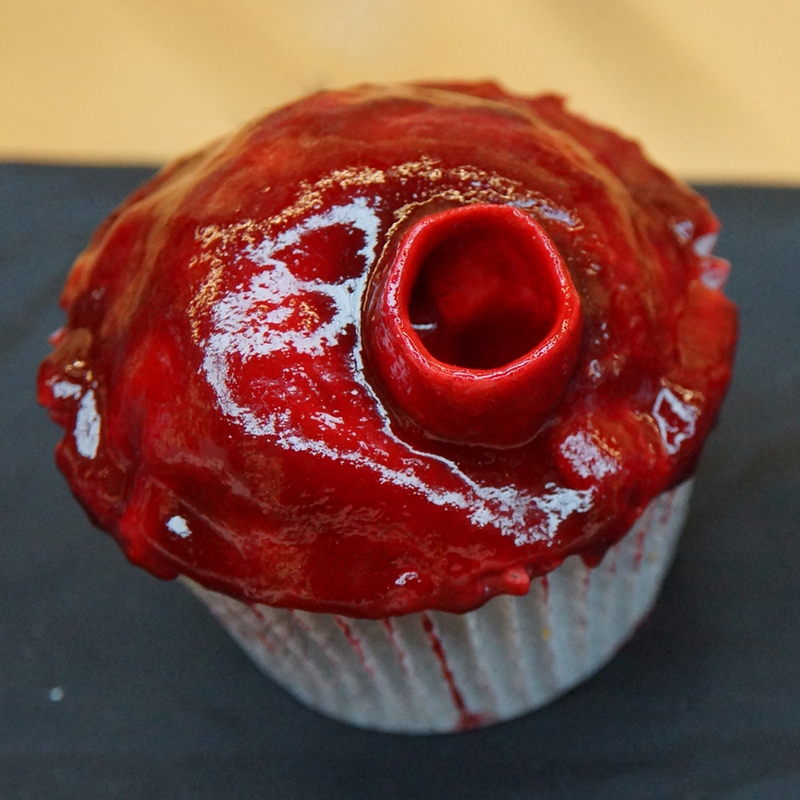 A more unusual opportunity to visit was provided by Eat Your Heart Out, an 'anatomically correct cake shop'. 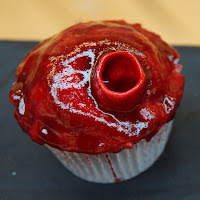 From aorta cupcakes to dissected arms, there was plenty to feast upon - literally the sweetest health education I've ever experienced! However, the real star of the event was the museum itself. Built in 1879, and opened by the future Edward VII, it retains a wonderfully Victorian atmosphere with its wood-and-iron interior, shelves of specimens, and spiral staircase. Five thousand specimens, from organs to skeletons, line the walls. Surgeon John Hunter was educated at the hospital and his bust now watches over the museum. In fact, Hunter would have had access to an earlier version of the museum during his studies: anatomical preparations were kept at the hospital from the beginning of the eighteenth century. 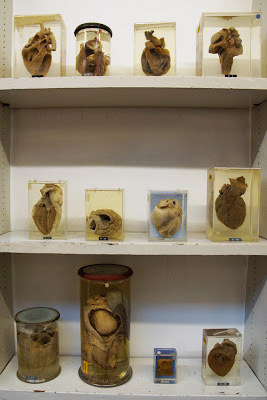 In 1828, two surgeons donated their own collections and encouraged the keeping of specimens in a central museum rather than private collections. In 1844, medical illustrations were added, with photography also used later in the century. 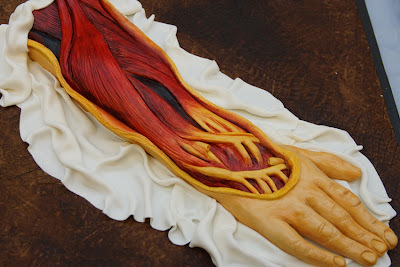 As medical education changed in the later twentieth century, so pathology museums fell out of favour. Only a few additions were made to the collection after 1912. 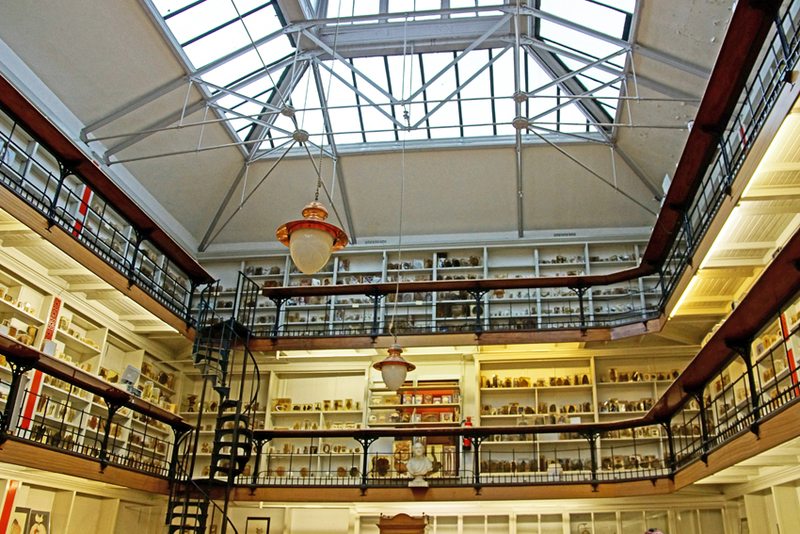 Happily, St Barts' museum is Grade II listed and has been undergoing a conservation programme, so it will continue to educate - about both anatomy and the history of medicine.